These pajamas for the intermediate sewist feature: Button placket pullover shirt, optional piping, contrast cuffs on top and pants, contrast elastic waistband, bias finished neckline and contrasting pockets. Sizes 18 months through 8 years. 18 pages of sewing instructions including color photographs. 26 pages of pattern pieces that are taped together to form the full-size pattern. All Blank Slate Patterns print on both 8.5X11″ paper and A4 size paper and include both customary and metric measurements. 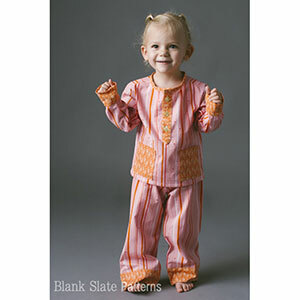 Suggested fabrics are mid weight cotton jersey, interlock, thermal or fleece.